All transactions are safe and secure with a reliable history in online purchasing behind each of our associates. 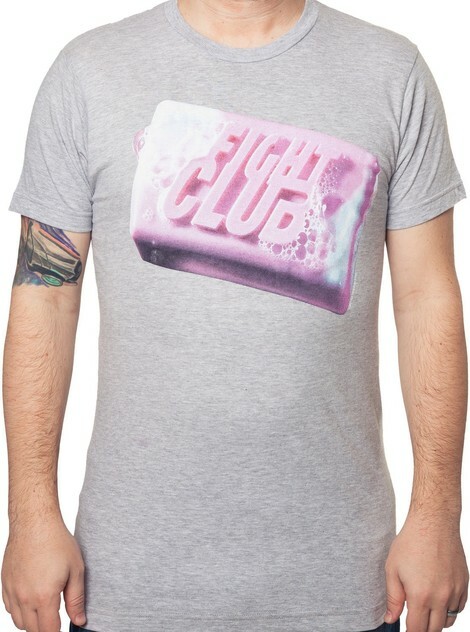 Buy the Fight Club Soap t-shirt to own Fight Club clothing and merchandise. This tee pays homage to the movie Fight Club's famous Paper Street Soap Company. In the movie, Tyler Durden (Brad Pitt) sells the soap to department stores at $20 a bar. Little do the customers know that the soap is made from human body fat! The Narrator explains, "We were selling rich women their own fat asses back to them." The distressed design on this grey tee features an image of a fist surrounded by the name of the underground Paper Street organization. This Fight Club t-shirt is available in several different colors. In addition to the Fight Club Soap tee above, browse the Fight Club Clothing Gallery for more apparel like men's and women's clothes, kids shirts or hoodies.